In terms of making money, a corrective A-B-C is the most important to spot. If correct when spotting, then what follows next is the long wave 3 — that’s where most of the money can be made in terms of directional bets. …then, that typically is a Wave 2 A-B-C flat. If we then see strong downside movement — then we should be beginning the wave 3 down. The corrective A-B-C Wave 2 can potentially be confused with a 1-2-i-ii in the opposite direction. Some other analysts may point out that the wave B down can potentially be a wave 2 down as long as it does not drop below where the beginning of wave 1 began. Then the C wave up — could be a wave (i) — followed by a wave (ii) — and then if it crosses above where wave (i) stopped — then that would be the beginning of wave iii way up. So you need to be careful about this possibility — the probability is quite small, however, if we can clearly see a flat wave structure — or a slightly corrective wave structure across all major index futures — S&P, Russell, and Nasdaq. Once the C-wave to the upside has been completed, as long as that top does not break upwards — then wave 3 should be beginning to the downside. Otherwise, if the top of wave C does break to the upside — then that wave C was not a wave C, but was instead wave (i) — and the pullback would be wave (ii) — followed by wave (iii) to the upside. On October 2014 — when we experienced a wave 4 drop –inside that wave 4 — was an A-B-1-2-3-4-5 pattern. The “2” in that pattern was basically an entire day up, followed by an entire down back to where we started. Then an entire day up to where we just were. This was an A-B-C flat. What followed next was a long wave 3 down. While the pattern is not as strong in the S&P500 for this playing out, we do see it fairly pronounced in the Russell2000. We see a 5-wave move down, followed by an A-B-C corrective wave the looks like a wave 3. As long as the top of that c-wave (1156) does not get breached, what follows next should be wave 3 down. Russell chart from December 2015 shows clear 5 waves down followed by 3 waves corrective wave 2 in A-B-C format. Is wave 3 down to follow? The corresponding S&P Futures chart for December 2015 shows a Corrective A-B-C Flat (potentially a Wave 2). Is wave 3 down to follow? The above charts are predictions I posted on this blog as the A-B-C Flat Wave 2 was forming. The big drop from 2075 to 1913 (it ended up going down to 1893 before a bounce) — happened shortly after completing an A-B-C wave 2 flat. We profited significantly by shorting this based on the pattern as predicted. 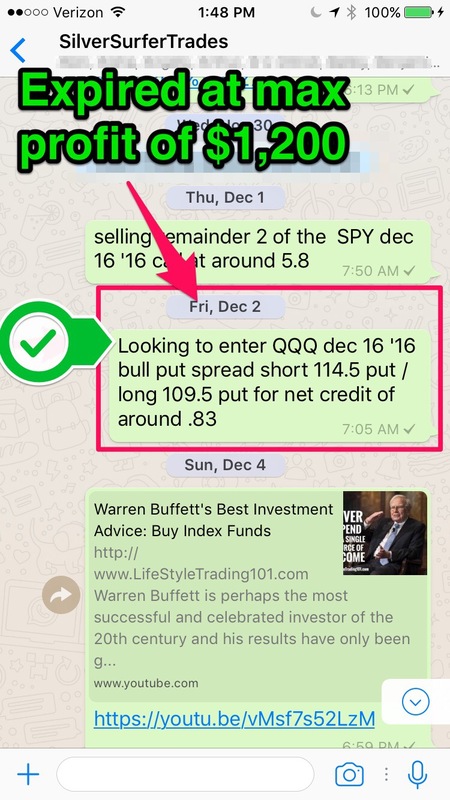 For this pattern, we executed a QQQ put spread. We recognized an A-B-C wave 2 flat with the potential for a breakout to new highs. 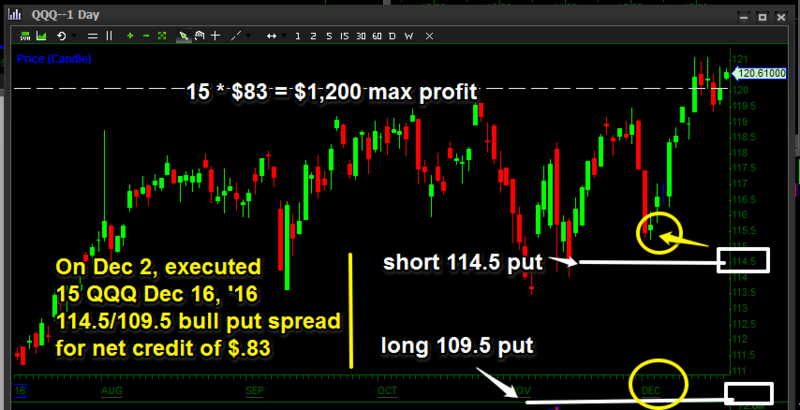 While the QQQ long call strategy would have captured more percentage profits, we chose the put spread strategy just in case the rally didn’t materialize.